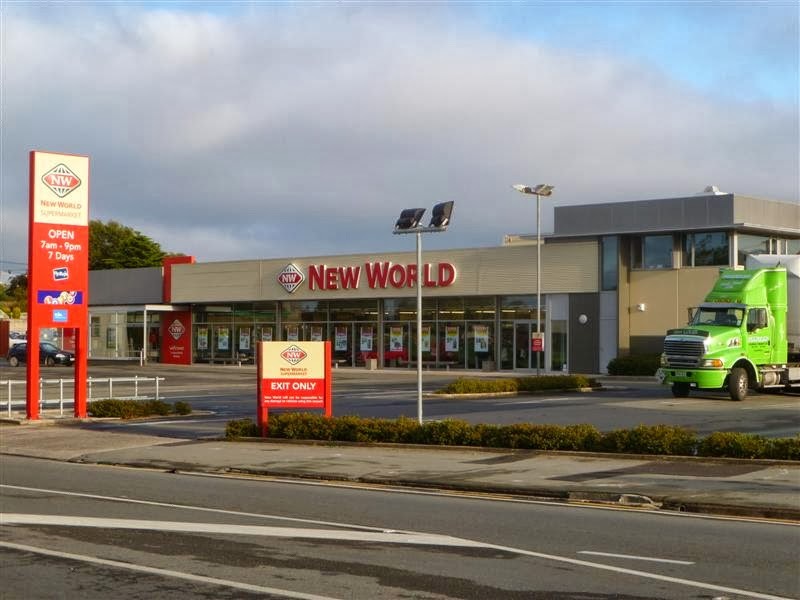 Oamaru New World in south Oamaru was open for business as usual after four staff were confronted by an armed burglar early yesterday. Photo by David Bruce. Four staff of the Oamaru New World supermarket were ''very courageous'' when they tried to calm a burglar armed with a firearm, knife and hammer early yesterday while awaiting the arrival of police. After about an hour and a-half of negotiations with two police officers, the man laid down his weapons and was arrested. He was charged yesterday in the Dunedin District Court with aggravated burglary, presenting a firearm to avoid arrest, three separate charges of presenting a firearm and possession of an offensive weapon (the knife). He was remanded in custody until tomorrow. The 62-year-old Oamaru man allegedly broke into the supermarket about 4am by smashing a front door with the hammer. He then confronted a baker and cleaner who were the only staff in the building at the time, Sergeant Blair Wilkinson, of Oamaru, said. They were joined about 30 minutes later by another cleaner and baker - making a total of two men and two women. The last two arrivals contacted police. ''They made the very courageous decision not to escape, staying with him [the alleged offender] to de-escalate the situation by talking to him calmly and also to avoid anybody arriving at work and not knowing what they were walking into. ''The staff were very levelheaded,'' Sgt Wilkinson said. Asked if staff were being held hostage or could leave, he said that was still unclear and inquiries were continuing. There was no clear direction they could not leave. However, the man did not face charges relating to detaining people against their will. Eight Oamaru officers, all armed, were involved from 4.39am. A portion of State Highway 1 outside the supermarket was closed. The Dunedin Armed Offenders Squad was activated, but was stood down before arriving in Oamaru. Two officers started negotiating with the offender and the four staff were able to leave. Sgt Wilkinson said the man laid down his weapons at 6.05am. No-one was injured. The supermarket opened at its usual time of 7am, although bread production was delayed because of the involvement of two of the bakers, New World owner-operator Justin Smith said in a statement. He praised the quick action of his staff who discovered the man and called the police. Mr Smith and the staff involved declined to be interviewed.